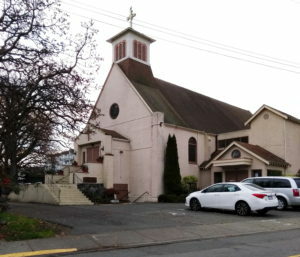 There are several reason for our presence on the internet..
First, we want potential visitors to Victoria, looking for a Traditional Latin Mass in this city, to know that there is indeed one, the only one on Vancouver Island apart from another one in Nanaimo, celebrated on Sundays by a visiting SSPX priest. Our parish priest, Fr. John Domotor, is a Diocesan priest who also celebrates Novus Ordo Masses and, once a month, N.O. Mass in the Hungarian language. 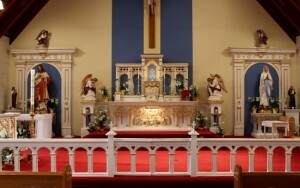 In addition the parish hosts an Ordinariate community offering Masses on most days. The days and times of the Latin Masses are found on the left panel of this page. For a complete schedule of Masses during the current month we refer to the latest Newsletter under the tab NEWS. This information is also available in compressed form under the “Masses” tab. The second reason is that we wish to share our substantial collection of Missalettes and Devotions with other Traditional Latin Mass communities. The production of these documents has taken us a considerable amount of time and we wish to spare others from having to go through the same effort. The Missalettes and Devotions can be accessed by clicking on the menu tabs. The Missalettes each cover a number of Sundays and some feast days. Together they span the entire liturgical calendar from Advent trough the 23rd Sunday after Pentecost, the last Sunday before Advent of the next liturgical calendar year. Other booklets cover feastdays of Our Lord and Our Lady. Each one of the Missalettes contains the Propers for the Masses and some Devotions. The Propers can vary somewhat for different locales and congregations, especially when it concerns commemorations. Finally, there are members of our own congregation who can benefit from these documents. Those unable to attend the Latin Mass due to age or illness can print a copy and watch a Traditional Latin Mass at home on TV or internet. 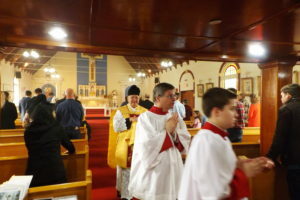 Failing watching Sunday Mass being celebrated in real time, the other options are to to follow a pre-recorded Latin Mass and make a spiritual communion which is found in most Missalettes.